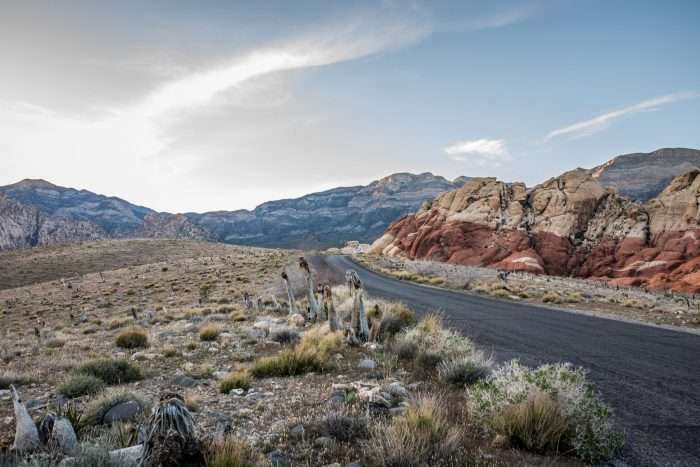 Discover Las Vegas, Nevada and the surrounding desert landscape in a whole new way with our women-only, small group adventure! It’s Vegas Explorer Chick style, baby! 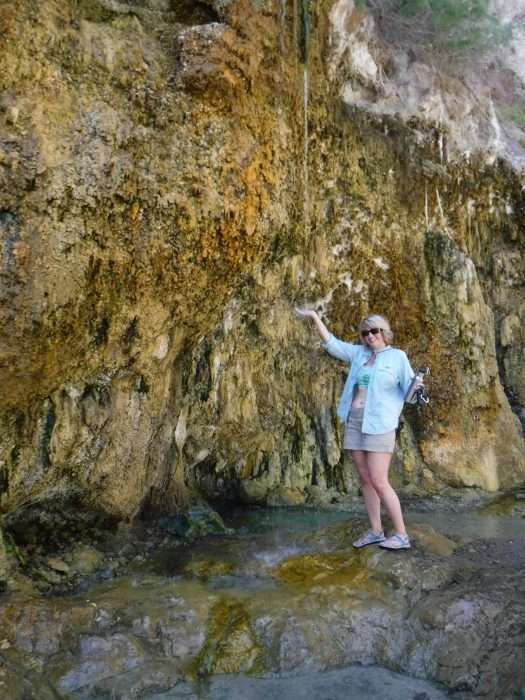 You’ll spend a full day rock climbing in Red Rock Canyon, experience the glamour of Las Vegas in a 4 star Downtown Hotel, spend 2 days on an overnight kayak adventure through Black Canyon and soak your muscles in natural hot springs before bed on this women-only, small group adventure! Your Vegas Vacation will begin at a 4 star Downtown Las Vegas Hotel and Casino. We’ll enjoy the glamour of Fremont Street for 2 nights. 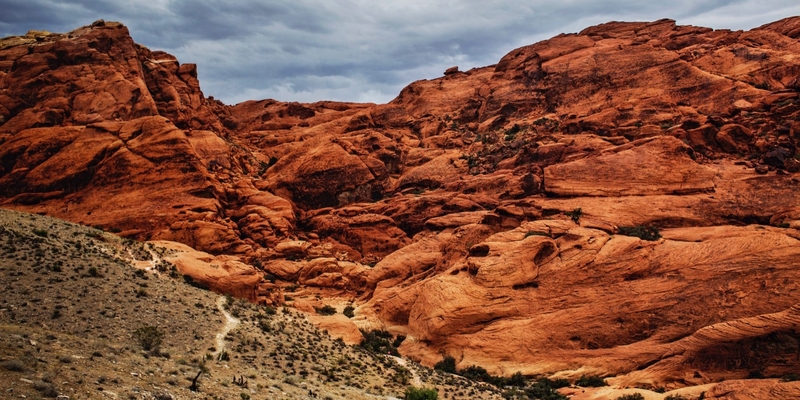 But, we’ll venture away from the crowds to spend a full day rock climbing and exploring the vertical sandstone walls of Red Rock Canyon National Conservation Area. On day 3, you’ll leave behind the city streets for the backcountry. Exchange the Vegas Neons for the Starry Skies. 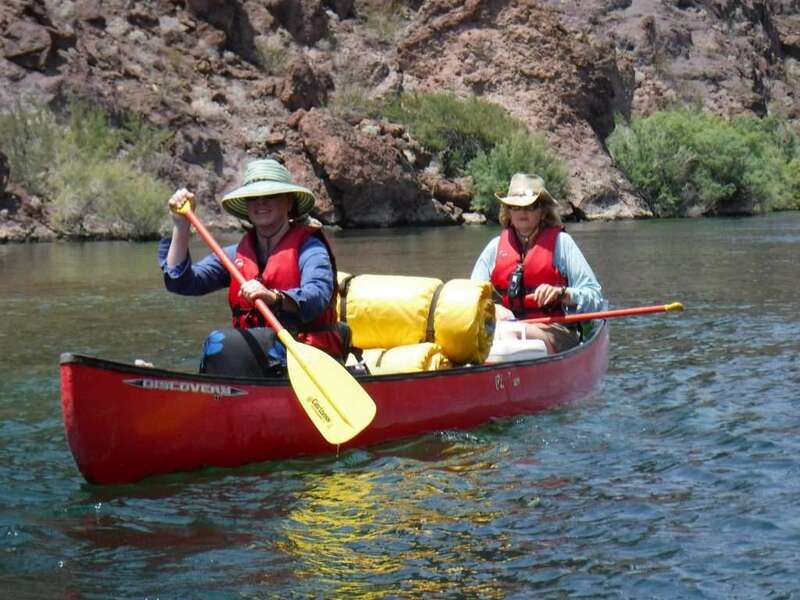 With our overnight belongings packed into a dry bag, we’ll launch kayaks at the base of the Hoover Dam to begin a 12 mile paddling journey through the Black Canyon on the Lower Colorado River. We’ll be kayaking along “moving flat water” that is perfect for a relaxing trip. Along the way, we’ll make frequent stops to areas only accessible by watercraft – natural hot springs, slot canyons, a natural sauna, Emerald Cave with gorgeous green water, historical sites, and ruins. We’ll camp on the shore trading our luxurious hotel bed for a comfortable tent and cozy sleeping bag. 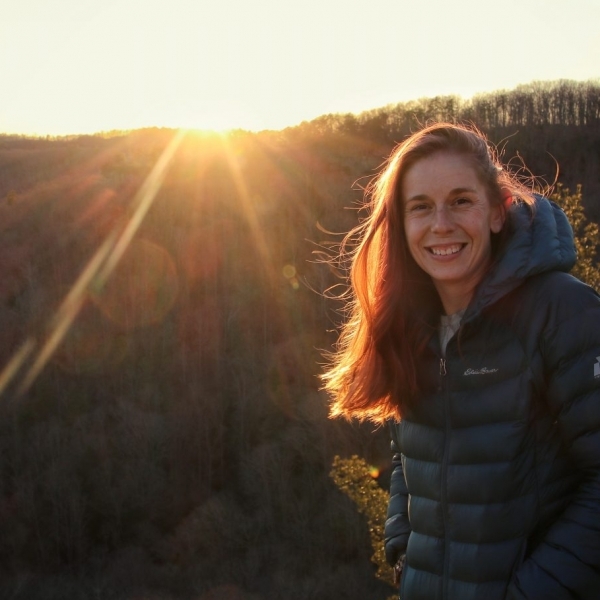 This adventure is for Explorer Chicks who love to experience multiple adventures, don’t mind trading their bed for a warm sleeping bag, and enjoy the best of both worlds – city life and outdoor adventure! 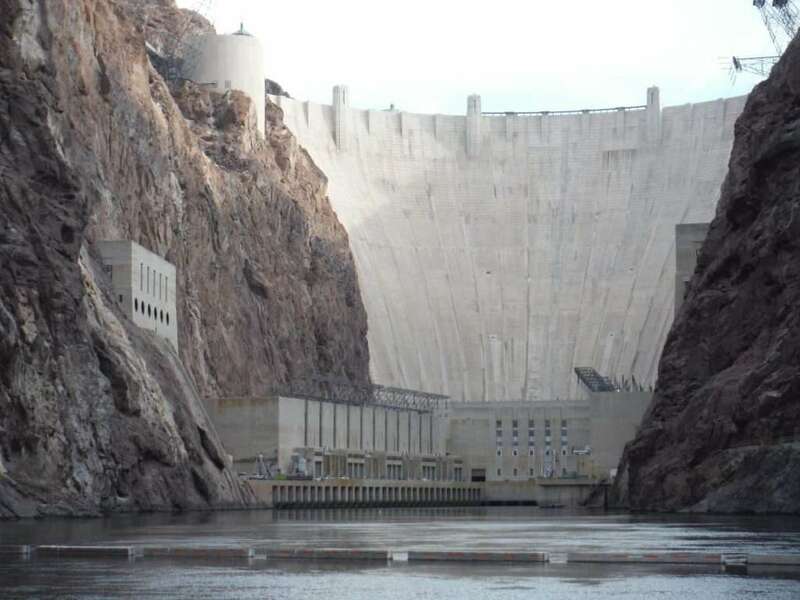 The National Park Service strictly limits the number of people permitted to launch at the Hoover Dam to 45 people/day on our overnight kayak adventure. PERMITS WILL SELL OUT FOR THIS DATE. Book your spot as soon as possible. 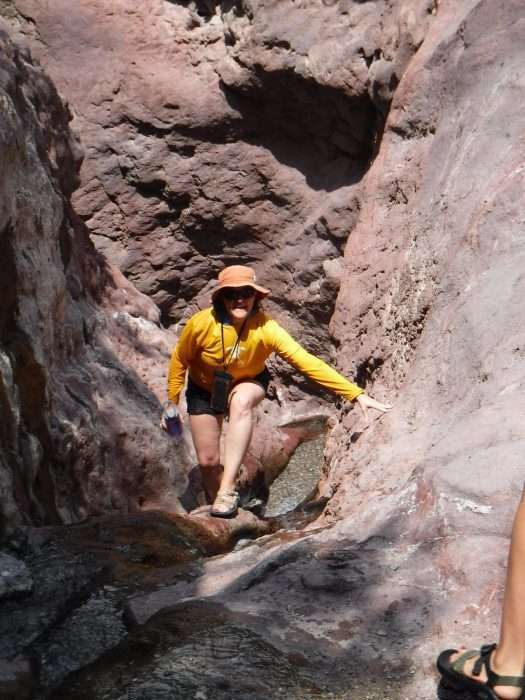 Explorer Chick will secure your NPS Permit as soon as the trip minimum is met and permits become available to reserve. Experience the shine and sparkle of Las Vegas while exploring the best outdoor activities in the surrounding areas! 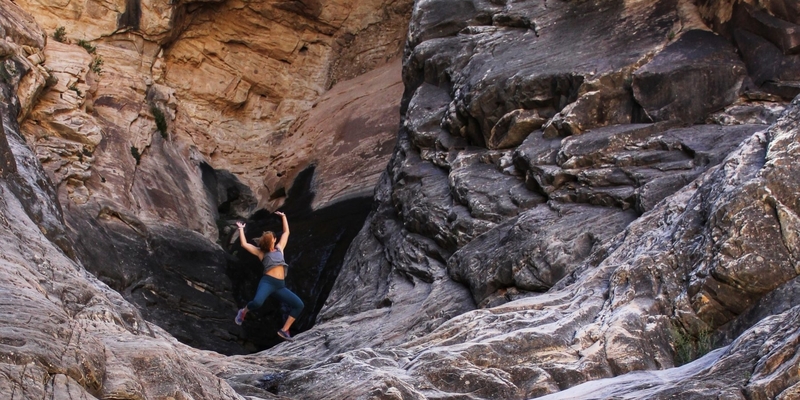 Spend a full day learning to rock climb in Red Rock Canyon with the intensity level as high or low as you’d like. 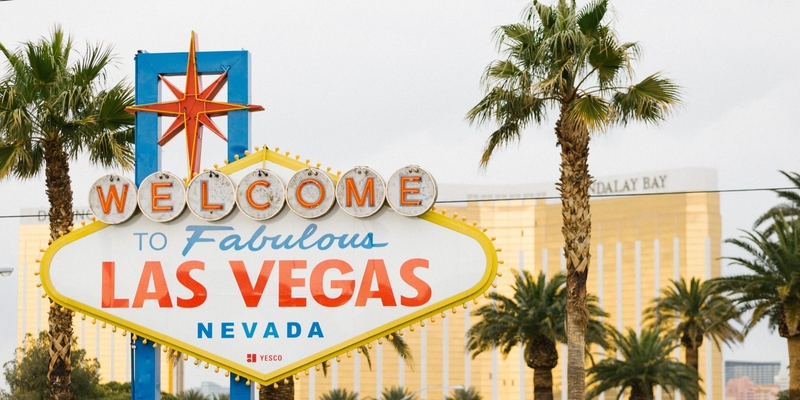 Enjoy the glamor of a 4 Star Hotel in Downtown Las Vegas including a variety of restaurants, luxurious pools, casinos, attractions, and more within a convenient walking distance. All Permits and Fees including the utlra-competitive Hoover Dam boat launch permits! *We require a minimum of 4 Explorer Chicks for this trip. Please confirm this trip is guaranteed and NPS permits are secured before booking your airfare. *Packages do NOT include your airfare, airport transportation, alcoholic beverages, travel insurance, Explorer Chick Leader Tips, meals exclusive of itinerary, or costs for additional activities. Day 1 – Arrival to Las Vegas, Nevada! Welcome to Las Vegas! You’ll be greeted by your Explorer Chick Leader upon arrival to our hotel. Your day is free to explore Las Vegas on your own. Our hotel will be located in the heart of downtown Las Vegas on Fremont Street. Explore Las Vegas and it’s many casinos, artistic parks, luxurious pools (our hotel has a shark tank you can take a water slide through! ), and anything else you could imagine. We will officially kick off your Vegas Vacation with a Welcome Dinner at 7:00pm. Plan to arrive in Las Vegas before 4:00pm. 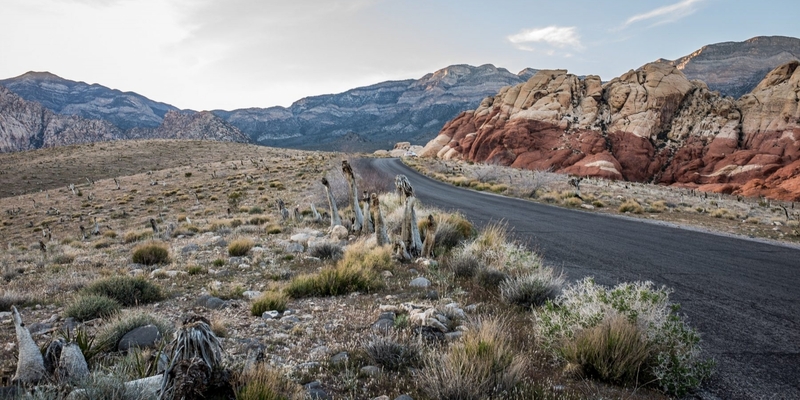 Today we’ll be exploring the vertical world of Red Rock Canyon National Conservation Area. 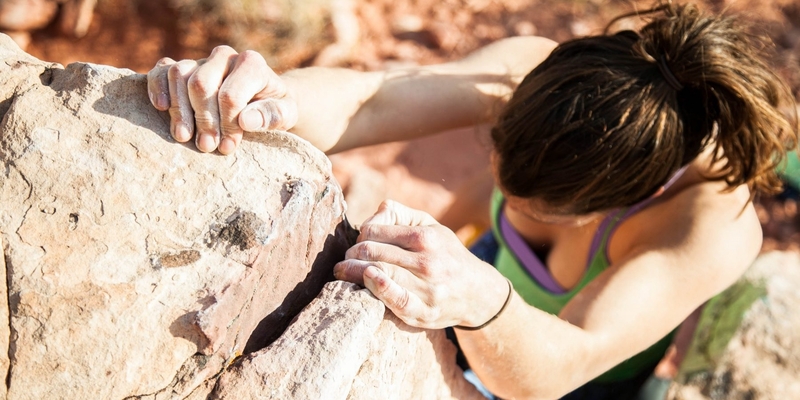 We’ll learn thorough rock climbing safety, how to belay, climbing movement and techniques all while in a beautiful desert setting in a world class climbing environment. 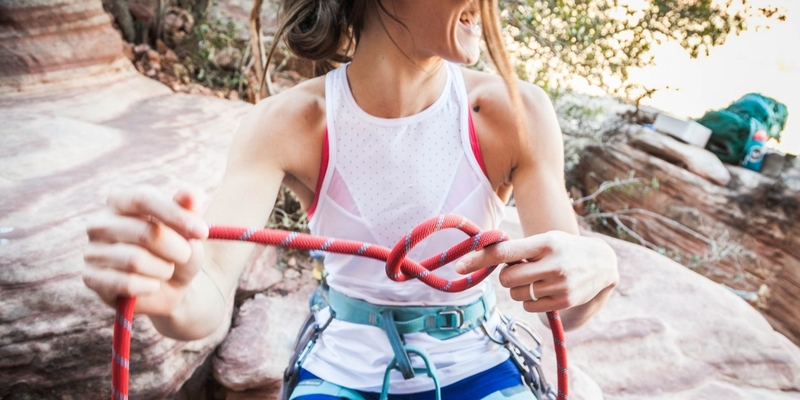 Throughout the day you’ll be both belaying your fellow Explorer Chicks and scaling red, sandstone walls. A boxed lunch will be included for you to eat at your leisure. 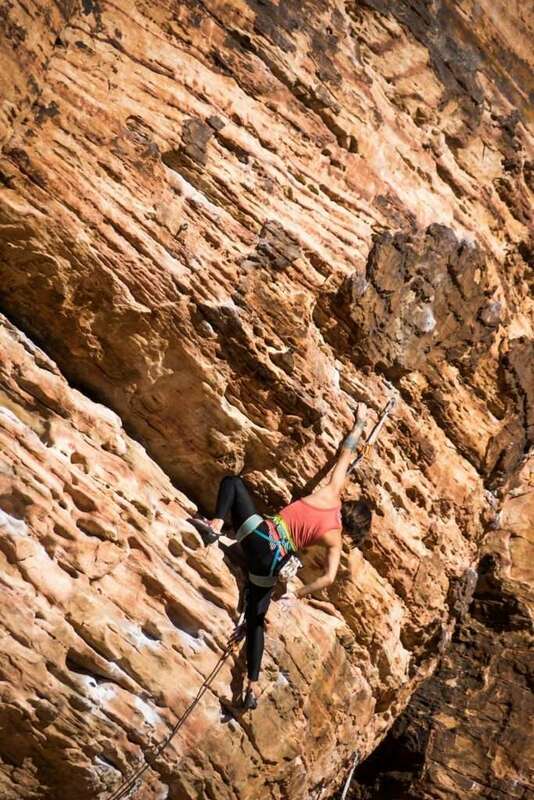 We’ll spend approximately 7 hours in Red Rock Canyon climbing to our hearts’ (and muscles) content! After rock climbing, we’ll return to our Hotel in Downtown Las Vegas. The evening is yours to explore more of the shine and sparkle that Las Vegas is known for. Today marks the first day of our overnight kayaking adventure. We’ll check out of our Downtown Hotel and load up our van to transfer down to Boulder City where we’ll go through a gear check and get packed up to head towards our boat launch near the Hoover Dam. As we near the Hoover Dam, we’ll bypass the main tourist areas and embark on a road closed to the public. 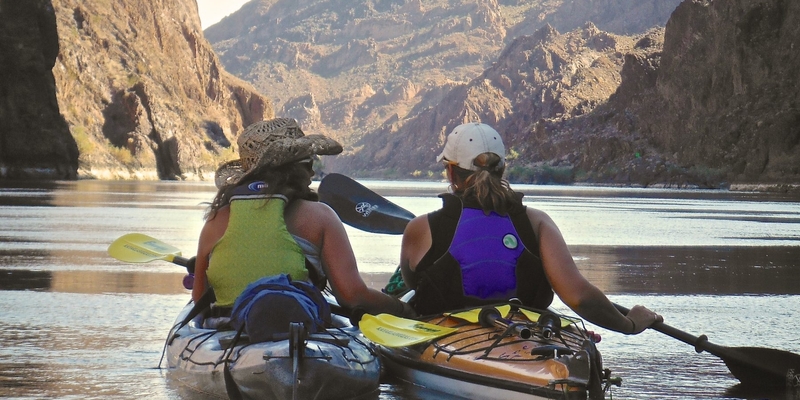 You will be one of 45 lucky permit holders/day to launch a kayak at the Hoover Dam! We’ll be escorted 1,000 feet down to the base of the Hoover Dam. At our launch site, we’ll marvel in the massive feat of engineering while taking in this “once in a lifetime” experience. After our kayaks are filled with everything we need for the next 2 days, we’ll launch our kayaks at the base of the Hoover Dam and begin our 12 mile river adventure! We’ll be kayaking through “moving flatwater”. No experience or kayak skills are necessary as we’ll go through everything you need to know! 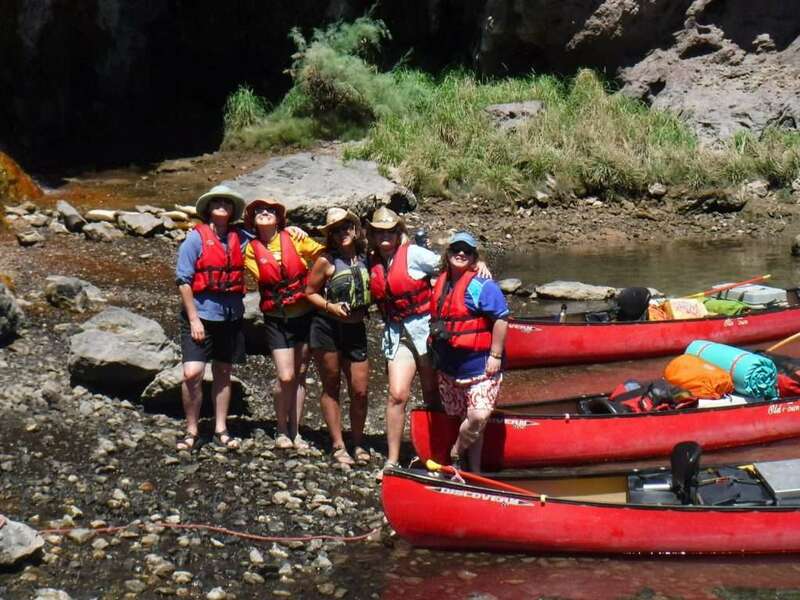 As we kayak deep into Black Canyon we’ll stop at a natural sauna cave, numerous hot springs in Gold Strike Canyon and slot canyons where we can explore deep into the narrows of the rock. We’ll find the perfect campsite underneath a starry sky where we’ll enjoy gourmet backcountry cuisine and a crackling campfire. Hot springs are a short walk away where we can soak before crawling into our cozy sleeping bag. We’ll wake up to the smell of coffee and to the Colorado River slowly running past our campsite. Today will be filled with kayaking to natural and historical sites. 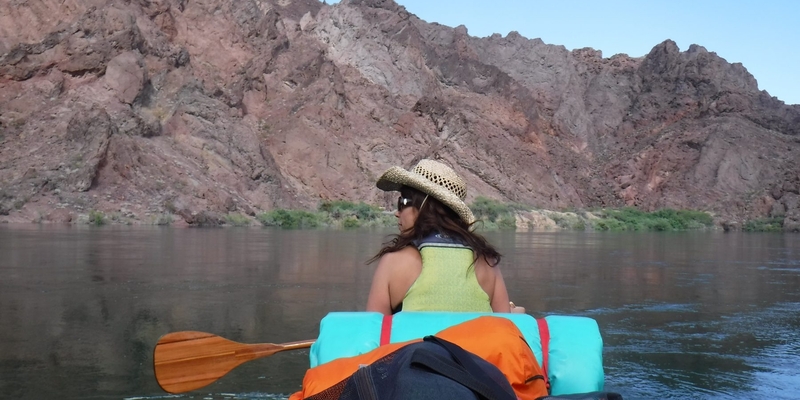 After packing up our camp, we’ll hop in our kayaks to paddle downstream past wildlife habitats with chances to see bighorn sheep, peregrine falcons, eagles, coyotes, foxes, and lizards. We’ll kayak past historic cableways, catwalks, and visit the ruins of a historic home site. 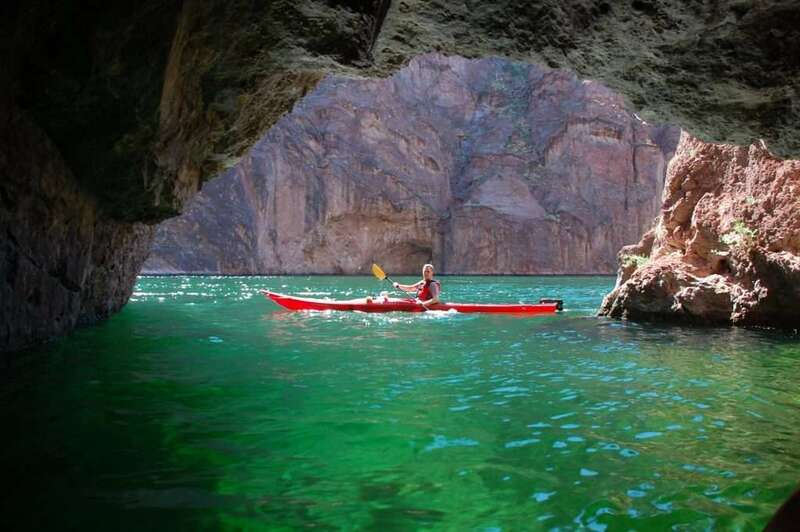 Our trip isn’t complete without paddling into the green waters of Emerald Cave. We’ll enjoy lunch on the beach before kayaking to Willow Beach Marina where we’ll meet our transportation back to Las Vegas. We require a minimum of 4 Explorer Chicks for this trip. Please confirm your trip is guaranteed and NPS permits are secured before booking airfare. Please allow 6 months prior to departure for confirmation of permits. Your adventure begins and ends in Las Vegas, Nevada. Arrival: Plan to arrive on Day 1 anytime in advance of our 6:30pm Rendezvous at the Front Desk. Official hotel check-in begins at 3pm. Departure: Plan to fly out of Las Vegas on Day 4 after 9:00pm. You will want to fly into McCarran International Airport (LAS). Your airport transfers in Las Vegas are NOT included with your package. You will receive a Travel Guide attached to your booking confirmation with all the hotel and all the information you’ll need to prepare for your epic trip! Your Vegas Vacation is geared toward experiencing a wide variety of activities. We’ll learn to rock climb in Red Rock Canyon National Conservation Area with the intensity as high or as little as you prefer. 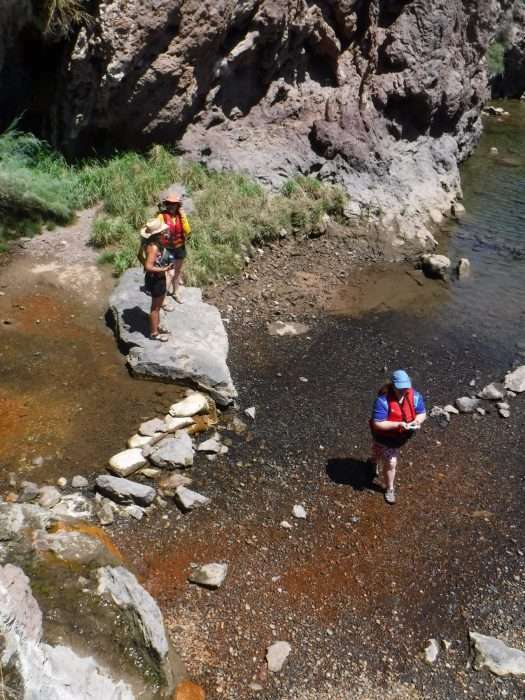 We’ll spend 2 days in kayaks on moving flatwater with hiking, slot canyons and hot springs to explore along the river. Although this trip is rated easy-moderate, we’ll be playing all day long! We highly recommend training prior to your trip in all conditions to arrive with a base level of fitness. Train how you play! Vegas vacation was …. absolutely fantastic experience! It was an adventure from start to finish. Women on the trip came there for different reasons and had different backgrounds, but the group dynamics was great. Every day we pushed own limits with climbing red rock canyon rappelling, peddling against 15 mph winds, hiking hidden trails, and through it all there was support and encouragement for each other… Jamie- our guide – you are the best! Thank you Explorer Chick for creating this adventure for me!